It's time to get back to the future and see what Terry McGinnis is going to do now that he's discovered that Bruce Wayne is still alive. Yeah, with people finding out that Terry was still alive previous to this series, it seems like we're getting miracle resurrections all over the place........ but that only stays true if our hero can catch up to Terminal in time so that he can take his mentor back and give him a great big, embarrassing hug that's sure to piss Bruce off something fierce........ that's why I suggest that Terry does it while he's still unconscious.......no fuss, no muss. 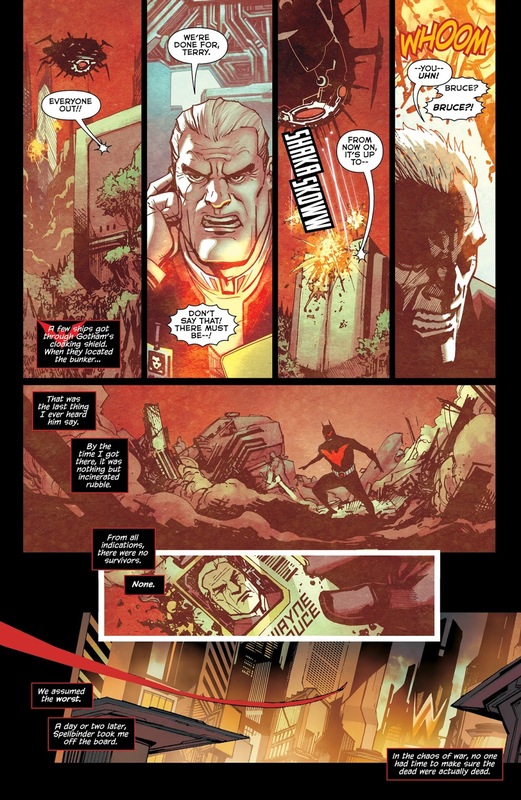 Okay, let's jump into this issue and see if we can see anymore goodies coming from Terry's new prototype Bat suit and if he'll be able to get to Bruce in time. Let's check it out. Our issue begins with Batman flying around Neo-Gotham, waiting for Max to get back to him about the air travel over the city so that he can hopefully pinpoint Terminal's destination and finally the intel comes in and Terry makes his way to the Wayne-Powers building. During his travel, we see him remembering back to the day that he thought he lost Bruce during the Brother Eye conquest. It seems that Bruce was coordinating the world's defense, but Brother Eye went and used their satellites against them and came in for the slaughter and by the time Batman had reached the spot, it had seemed like there were no survivors............ it's not like Batman would have the ability to check in on this either because on top of a world war being fought, it was soon after that that Spellbinder took Terry off the playing board. It seems that the whole reason that Terminal has actually kept Bruce alive, who he found in a medical tent and no one else recognized him, was because of a certain device that allows you to tap into any computer in the world, known as Keystone............ How Terminal found out about Keystone I have no idea, but besides for the money that he's been siphoning off of Bruce all this time, Keystone's the big payout. Thankfully, Terry knew a secret entrance to where Terminal and his janitor lackey were heading and stops the bad guys in their tracks........... Well, he slows them down, but the fight is put on hold when the janitor lackey goes and awakens Bruce and then pushes him off a building ledge to make Terry go and save him while Terminal and the janitor make their escape. In the end, Bruce tells Terry that he really should have gone after Terminal, but since Terry had backup in Max and Matt in them shooting down Terminal's ship, our hero doesn't seem too worried about them getting away. 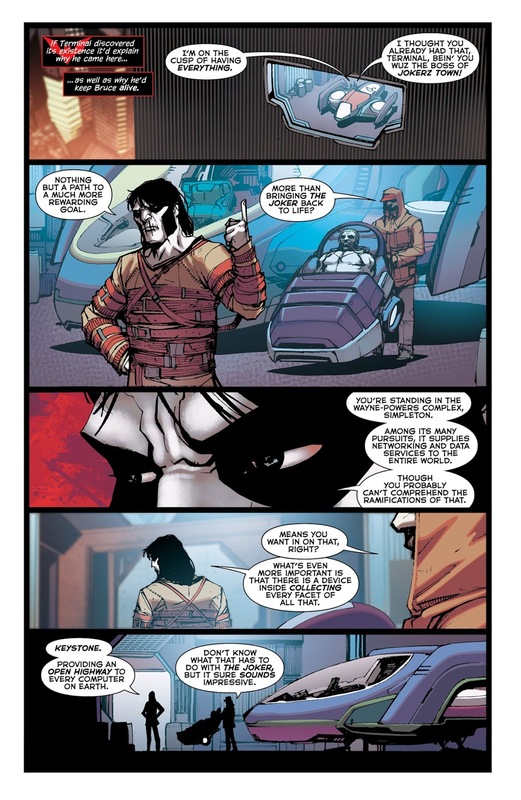 Maybe he should be though because as we find out at the end of this issue, the janitor lackey to Terminal this whole time has been the actual Joker himself and he takes the opportunity to teach Terminal a lesson about using the name of the Joker to make himself the big shot he thought he was........... I don't know if the lesson will really stick though because it really looks like the Joker beat him to death. 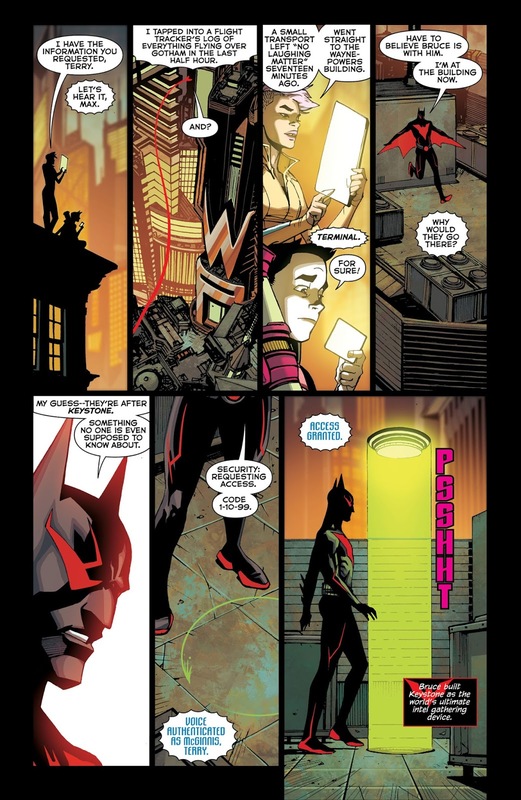 That's it for this issue of Batman Beyond and while I enjoyed this issue enough, I found the whole point to Terminal keeping Bruce alive this whole time a little convenient because out of nowhere it seems that Terminal wanted this Keystone device the whole time and him waiting around to get it just doesn't make any sense to me.......... let alone, him knowing about it at all. 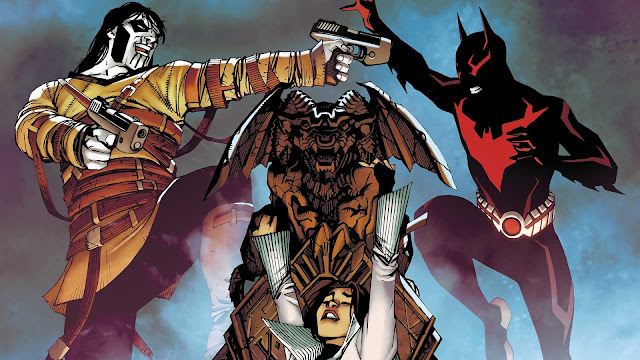 Just a really quick moving issue to get Bruce back in the spotlight of this series and to throw that out of nowhere cliffhanger at us of the Joker still being alive. The art in this book looked great even though the new Batman Beyond suit is still going to take some getting used to, but overall, a kind of lackluster ending here that seemed to have to be rushed to a conclusion. 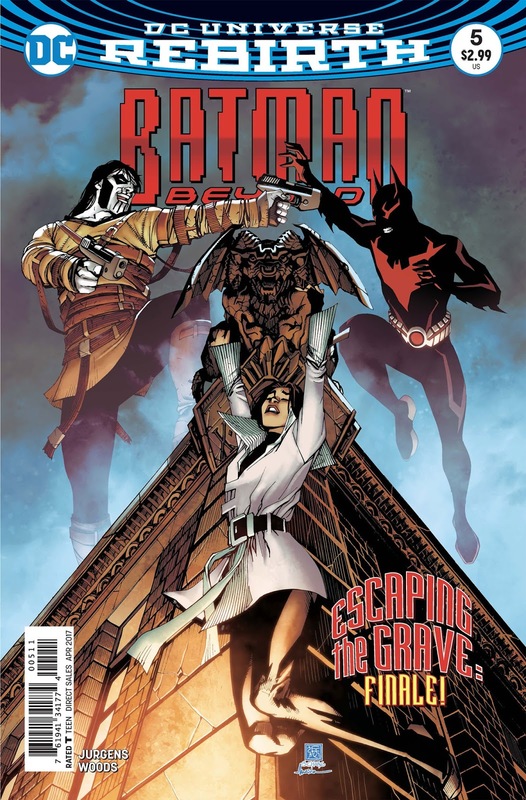 While I've been enjoying the Batman Beyond series enough, I have to say that we really had to force our way to an ending here and because of that, the whole shebang comes off a little lackluster in the long run. We do get some decent reveals here though and some great looking art, but overall this issue left me wanting more because everything just seemed to be coming out of nowhere. I liked this issue more than a lot of other series I'm reading right now. I thought the dialogue at the end was a little weird though, when Bruce was trying to tell Terry the janitor was Joker.